Heat is widely available in the ground, air and water around your house. These natural sources of heat are constantly replenished by the sun, wind and rain. A Dimplex heat pump system will harness these free and renewable energy sources for heating your house and supplying hot water at a very low cost. The role of the Dimplex heat pump is to 'pump up' heat from a low temperature source, for example the ground or the air and release it at a higher temperature into your central heating system. Dimplex heat pumps are the innovative and environment-friendly answer to increasingly scarce and expensive energy resources. Our Dimplex heat pumps extract up to 80% of their heating energy from the environment – whether from the ambient air, the earth or the ground water: this freely available renewable energy makes you independent of oil and gas prices. 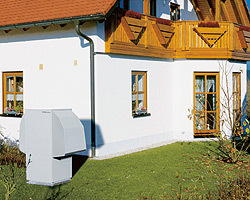 Dimplex geothermal heat pumps draw heat from solar renewable energy stored in the earth. 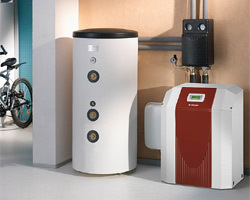 Dimplex brine-to-water heat pumps draw up to 80% of the required heating energy from the ground. The solar energy stored in the ground is available free of charge and in unlimited abundance. If the installation area is large enough, horizontal geothermal collectors can be used, buried at a depth of approximately 1.2m and spaced 0.75m apart. If land space is limited the geothermal collector can be installed vertically in a borehole, drilled up to 100m in deep into the ground. Due to consistency of ground temperatures below surface level, geothermal heat pumps provide high levels of efficiency all year round. Even cold air is full of energy and Dimplex air source heat pumps use the freely available renewable energy in the ambient air to provide efficient heating at air temperatures as low as -20°C. Dimplex Air source heat pumps are suitable for either indoor or outdoor installation and provide significant installation cost benefits over geothermal systems, as there are no requirements for expensive geothermal collectors to be installed. Dimplex Air source heat pumps can provide 100% of the heating requirement down to air temperatures as low as 0°C, and are easily boosted for the few days of the year when temperatures fall consistently below this level.